Now here's a theory, not a fact ... yet. RPK says it, the plot thickens and goalposts change all the time that even his seasoned operative mind is a little muddled, exhausted by the intrigues of parties using the 1MDB to try and bring down Najib Razak. 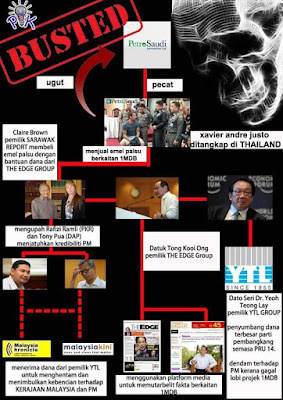 Read A new dimension to the 1MDB controversies to understand how thick they (plot and plotters) have grown. Now, you and I know RPK. You give him half a truth and he use that to hypnotise the masses with a series of plausible theories that may take years to snap out of. He's who Clare of the Sarawak Report should have as an ally if she wants to save her reputation. But RPK does seem to have something on Sufi Yusof, Dr M's loyal aide, or at least he believes he does. Now I know Sufi - in fact, longer than I know RPK - from when he was a cadet reporter back in the early 90s until the time he briefly served Najib Razak as the National Comms Team head. p.s. As for the poster above, it's the kiind of plausible theory that's gone viral, h e r e and t h e r e. The Sarawak Report is reeling so I expect The Edge and Tong Kooi Ong to come out with everything they've got. I expect threats, I expect lawsuits. Credibility and integrity are on the line. 1MDB notes speculative statements in the media today, attributed to YB Lim Kit Siang and YB Tony Pua, questioning if Datuk Shahrol Halmi and Arul Kanda would attend upcoming PAC hearings in August. 1MDB repeats our commitment, as announced on 25 May 2015, to attend the PAC hearings. It is clear that the speculation today by both individuals is to divert attention from the recent heavy criticism of YB Tony Pua, a member of the PAC, for his many statements that may be seen as prejudging 1MDB although the PAC process has yet to be completed. 1MDB has every confidence in the PAC process and trust that the honorable members will carry out their role in a fair and professional manner. We hereby reconfirm our attendance and commitment to fully cooperate with the PAC. They can say whatever they want. I know that Sufi is a better person than them all. Sufi never did a SD accusing Rosmah of supervising the murder of Altantuya. Someone else did that. Mahathir/Clare Brown upah Rafizi Ramli & Tony Pua??! Kah kah kah teori apa ni? Teori sampah? RPK is not Clare's ally because Clare did not pay him to save her reputation. But RPK is Najib's ally because Najib pays him to try salvaging his reputation. I think when they say he was misleaded, that was a serious accusation towards that man's advanced intelligence. He was the one steering us from nowhere to be where we were (2003 - i hve to state this because as the years gone by we went downward spirally) and by judging his apperances in many invitations he is as sharp as he was during his 22 years premiership. And if SK and TA mind to examine closely, his arguments are valid and still unanswerable most of them. And the questions are totally independent to any Claire Brown or any Report and of course any Justo. For example, why the company bought something for billions when they can just wait and then buy it for a song? And then use whatever influence the Government got, reapply the license for generation and violaaa! And the 'almost 3 billion' thing. He was correct as well. Show us where is the money and solve the problem. too much drama even if swkrprt bought stolen email or whateva we are concerned about the truth about the emails not how it is obtained. how to sokong gov. look at felda share, fgv, then tabung haji and now mara. What's the "Raja" doing in the RPK namesake? Sounds like a King of Spin with a handle on English rhetoric. You forgot last sarawak state election.